Like many artists, I've experimented in a variety of media in an attempt to find better ways to express what I am doing. My forte has been the presentation and exploration of the human figure and portraiture, with a sprinkling of a few other things! While most of my work tends to be 2-dimensional, I have ventured into 3-dimensional sculpture with clay and various other materials, notably textiles and embroidery, again with a concentration on the figure and costuming. This art portfolio represents a glimpse of my work - with a cross-section of media and subject material, and will change from time to time. The mixed media series (including pets) is all done on acid-free papers, and often has a mixture of oil pastels with chalk, with other traditional and not-so traditional materials, occasionally. The oil paintings represent a more traditional painting method for presentation of portraiture, mostly done on a larger scale. 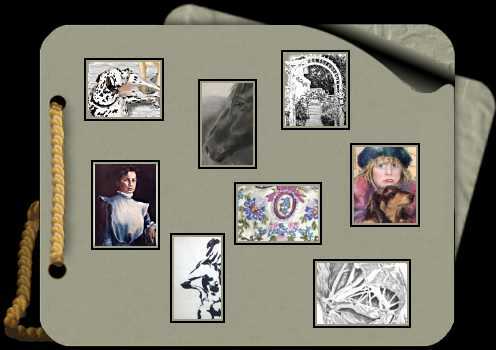 Illustration covers digital illustration, life drawing in various media, houses, and medical illustration, as well as a representation of mural work. "painting" as illustrations for a children's book, now widely available in bookstores. The textile segment shows samples of tea cosies- developed to be not only highly decorative, yet also functional pieces. This idea extended into the tea cosy "maid" or doll, in response to that 'what to get someone who has everything' idea! A friend encouraged me to expand the doll cosy into a complete figure, which provided a wonderful new set of technical challenges, and led to a small line of miniature antique hats, as well. and may not be reproduced in any way without express written permission.